Recently, a team of consultants at my Arlington-based firm, Excella Consulting, decided we wanted to use our free time in the evenings and weekends to take a stab at changing the world. We wanted to take our skills from our day jobs in change management, business analysis, development, user experience, and visual design to create something impactful, and we’re lucky enough to work at a place that encourages that. In 2016, the Hunger and Homelessness survey from the US Conference of Mayors found that DC had the highest rate of homelessness out of 32 major cities in the US. In fact, the city has 124 homeless people for every 10,000 residents. Even worse, according to the National Coalition for Homelessness, 39% of the homeless population is under 18 years old (opens PDF). And the average age of a homeless person? 9 years old. 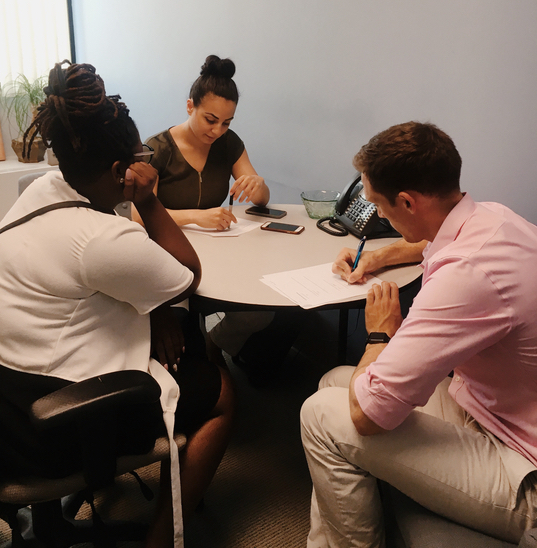 We began working with the Opportunity Project, an initiative out of the Obama White House, to create a problem statement that would empower us to tackle this problem of youth homelessness in a way that would enable us to leverage federal data sets from the Department of Education and Department of Housing and Urban Development to create a solution. We were right on track, but we had a huge problem. Do homeless youth have the same access to technology that we do? As a team, we went back and forth on this for hours. Our “empathy” caused us to feel stuck in the privilege our access to technology provided us. We felt as though we were making assumptions about our users at every turn. Could we ever create a digital solution for a population that doesn’t have access to the same things that we do? How could we move forward with creating a product that requires internet access when it is a platform our users wouldn’t be able to access? 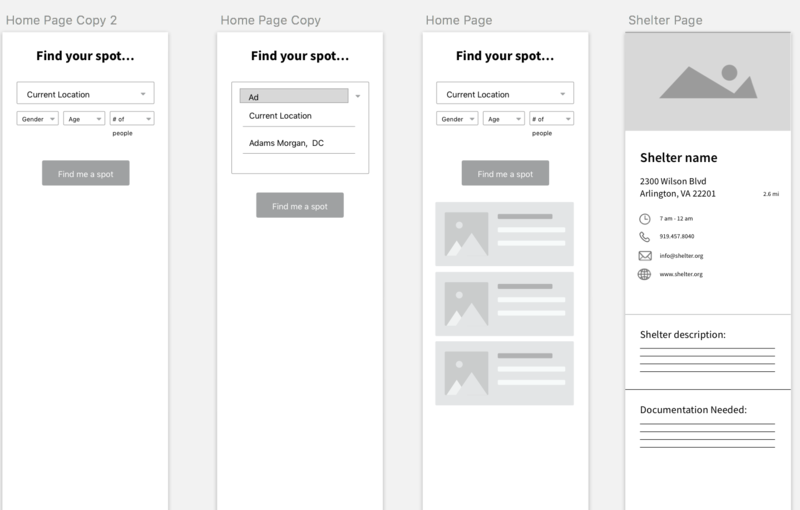 Our initial wireframes were designed around the idea that we could create a means for homeless youth to find nearby shelters and resources. We designed these half-heartedly, wanting to make a difference but strongly feeling as though these could only resonate with people who would be able to access them, and knowing our user base would definitely not be able to. 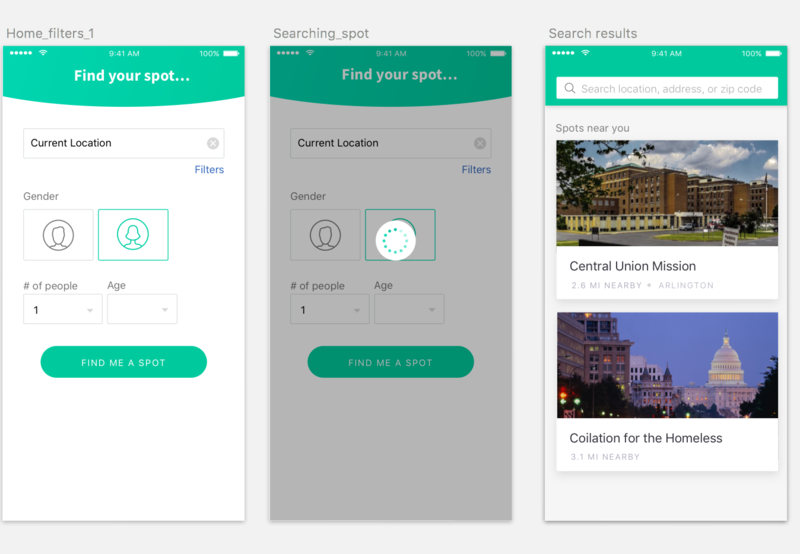 We realized the next step was the only step we could take as designers: to conduct a usability test and see how and if these initial designs were resonating with users. So we prepared and refined these higher fidelity mockups, uploaded them to InVision, and headed to Doorways, a shelter in Fairfax, Virginia that serves women and families who are victims of abuse. We were prepared for these designs to fail. Our findings floored us. We walked into that shelter with pre-conceived notions about not only what homelessness looks like, but what it means to be homeless. We sat across people who looked exactly like us—our colleagues, classmates, or the person we sit across in the metro. When we asked about their phone usage, they pulled out iPhone 7s. When we asked about their data plans, they told us about AT&T and Verizon plans that were the same as ours. And when we asked them what websites they frequented, they showed us the friends they followed on Instagram and Facebook. Using affinity mapping, we processed our test results and turned them into action items that would inform what our product would become. We finally knew what we were doing, and were headed in the right direction. There was one thing I couldn’t move past, though. As designers, we’re trained to have empathy in the work that we do. Often, this empathy for users gives us enough of a starting point to begin problem solving. But what happened here? Why didn’t that work? Well, what happened here was that empathy was not enough. Alone, empathy can never be enough. And when empathy is rooted in a privilege that keeps you from leaving your comfort zone to interact with and understand your users, it can actually become an impediment. Empathy can prevent you from doing your job properly, because you will, inevitably, be designing for users you think you know. Turns out that’s the thing about empathy—you might start out with some, but the rest of it is acquired. The only way to truly have empathy as a designer is to seek empathy by getting to know your users. And the only way you can really know your users is to meet them where they are. So get out there! Go to homeless shelters, healthcare facilities, and counseling services. 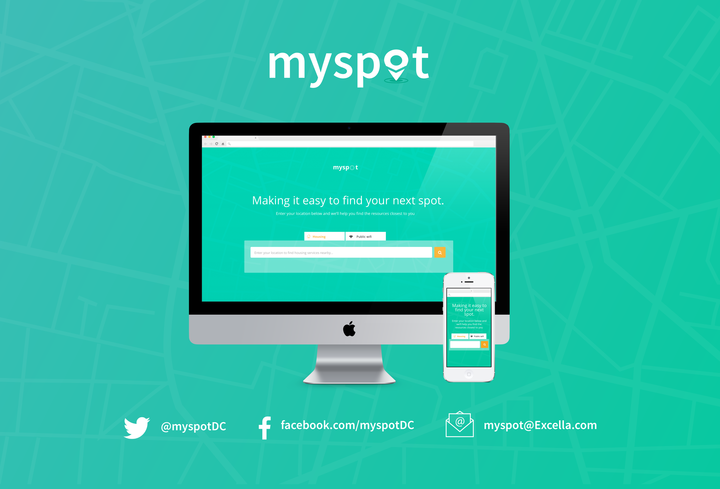 Go to street intersections and schools, to parks and museums and coffee shops. Find your users. Talk to them. Understand them. Then and only then—armed with actual empathy—start to build a product that they will love! 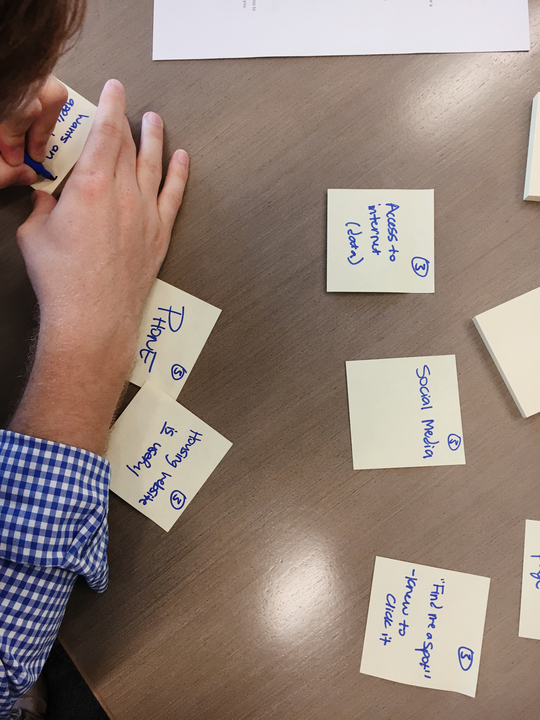 Want to share your team’s process here on the InVision Blog? Get in touch: @InVisionApp. Hareem is a San Francisco-based product designer at Segment working on Personas, a product built on the Segment platform that helps companies better understand and take action on their customer data. Previously she worked in D.C. as a UX Consultant, where she worked on federal, commercial, and non-profit projects. She is passionate about design for good, Taco Bell, and really bad dad jokes.